IIB Blogs – 25th annual Taste of New Paltz. 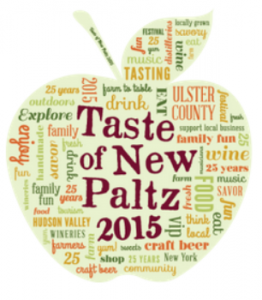 25th annual Taste of New Paltz. All began during a sad afternoon at our motel. Everyone were bus y, someone studied in their room someone else in the library and three girls were doing kayaking. In my mind there was only one word: STUDY, but it was a beautiful Saturday, last summer weekend, it was hot and there weren’t clouds in the sky. Okay, I can’t spend my time here.. I want go out!During the week, I saw many posters about an annual festival in New Paltz: Taste of New Paltz. I was so curious … so I called a cab and decided to spend one hour there with one of my friends, before start to study. In less than 10 minutes we arrived in a unknown part of the city; there were many beautiful houses, among km of wheat fields and sunflowers and then.. a huge green lawn, many families with children running around on the grass. It was a wonderful scene! It was the 25th year that New Paltz organised this event and we could not miss it. After paid $10 to enter, my friend Gaia and I started to taste every kind of food. Wasn’t that the purpose of the fair?! We started with a strange fried empanadas with beef, I discovered that this is one of the typical dishes in Jamaica.. It was delicious! The next stand prepared, however, a special kind of corn with cheese, curry and paprika, but the best taste of this incredible afternoon was a amazing pizza cooked with wood-oven, as the Italian tradition. Everything about the pizza reminded me of my country. At the end, as a real lunch, we bought an exquisite mini chocolate cupcake. After about an hour, at the end of our tour, I realized that there were many activities to raise awareness of their food and products to the citizens of New Paltz .. Wow, this was great! In this way, I was able to try dishes from restaurants that I didn’t know before and certainly I’ll try after this experience. It was a really good afternoon spent with my friend! Beautiful place, nice people, good music and new food. Now, are you asking why the symbol of this fair is an apple? Try to get out of this fair without tasting a dish in which there was the apple! It’s impossible, trust me. Seems like you had a great day, hope you get to eat at the pizzeria for real! Next ArticleA new experience is always a fun experience!